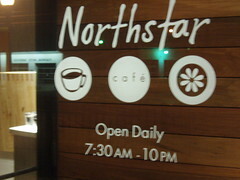 The Northstar Cafe did a stealth opening on March 1st or 2nd. The Grand Opening will be April 22nd (Earth Day). Breakfast should start by then as well. I was not really stalking the new location – but I did drive by several times per day. These were my impressions of the place peeking in a few nights before it opened. The inside has the same coolness yet spartan elegance of the the Short North Northstar with a few refinements. The flow of space looks better. There are four large open ended booth-like tables that look like they would sit 8-10 people and two small nook booths that look like they will sit 4-6. Expect to see the Gourmand there with his various food support groups dining away in bliss. It has sometimes been a struggle to seat larger groups at the other location so looks like that was fixed for Northstar II. There is ample, easy parking in the back (much easier than the Short North location). The kitchen looks bigger – so maybe a slightly expanded menu (please serve me soup!). I can’t wait – so stay tuned for a review or several of them since I can ride my bike there in about 3 minutes. Yipee!! Expect a full review after the grand opening – I will be there about once per week until then. Post your comments and share your own thoughts about the new Northstar until then. Thanks. And some more info from a new Blog on the scene. I dropped in for dinner on March 6th – it was wonderful – the love affair continues! 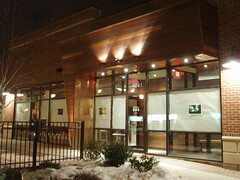 See my earlier review of the Short North Northstar (September 2006) for more about the food. I dropped in again for dinner on March 21st. One of our items was delayed because they ran out of chicken – so we opted to pinch hit with tofu. For our trouble – we were given two coupons for free entrees. And every employee we spoke to raved about the restaurant and the owners – Northstar has some serious good karma building. This entry was posted on February 27, 2007 at 3:26 AM	and is filed under restaurants, Vegetarian Friendly. Tagged: Northstar Cafe. You can follow any responses to this entry through the RSS 2.0 feed. You can leave a response, or trackback from your own site. 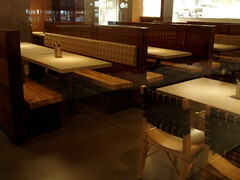 northstar’s now open and serving lunch and dinner, 7 days a week. had a scrumptious dinner there last night during the brief but block-wide power outage. breakfast service to start in april. welcome to the neighborhood northstar! Woohoo! Can’t wait to come by and check out the Clintonville edition!! Well it gives my friends and I a second option if my local Short North one is too busy on the weekends. It’s also a surprisingly kid friendly place (at least the Short North one is). We’re waiting until the late April breakfast opening for our visit to the Clintonville location. You’ve won us over. The Thai wrap is utter beauty! I love the restaurant and wonder if they would ever share the recipe for the homemade ginger ale which is just so refreshing. All I want to know is what syrup is used – maybe it’s homemade. Please share. Love it! Hope it makes it in the “ville”. My husband and I have date night there and just eat and read magazines in peace!